W. P. Lehmann, a professor of German languages, believes the association with death is a linguistic accident. The Old Norse nárhvalr (whence the English narwhal, the French narval, the German Narwal, etc. ), he says, was a vernacular play on the word nahvalr—the way high-bred corn is used in place of hybrid corn, or sparrowgrass is used for asparagus. According to Lehmann, nahvalr is an earlier, West Norse term meaning a “whale distinguished by a long, narrow projection” (the tusk). In other words, Lopez believes, per Winfred Lehmann (obituary and CV here), that the commonly accepted etymology of narwhal is the result of a folk etymology in Old Norse. Some, nevertheless, still call the narwhal “the corpse whale,” and the unfounded belief that it is a cause of human death, or an omen or symbol to be associated with human death, remains intact to this day in some quarters. Animals are often fixed like this in history, bearing an unwarranted association derived from notions or surmise having no connection at all with their real life. Probably < Danish narhval, cognate with Norwegian narkval , Swedish narval (1754), and further cognate with Old Icelandic náhvalr < a first element of uncertain origin (perhaps < nár corpse: see need n., with reference to the colour of the animal’s skin; or perhaps shortened < nál needle n., with reference to the straight tusk) + hvalr whale n.; the epenthetic -r- in the Norwegian, Swedish, and Danish forms has not been satisfactorily explained (see note below). Compare Middle French nahual (1598; French †narhual (1647), †narwal (1676), narval (1723)), Spanish narval (1706), Italian narvalo (1745), Dutch narwal (1769), German Narwal (18th cent. ), all ultimately borrowings from Scandinavian. Alternative etymologies connect the first element with the Germanic base of either nase n. or narrow adj. ; both of these suggestions assume that forms with -r- are primary, and that forms without -r- (the earliest attested forms) are alterations by folk etymology, after Old Icelandic nár corpse. 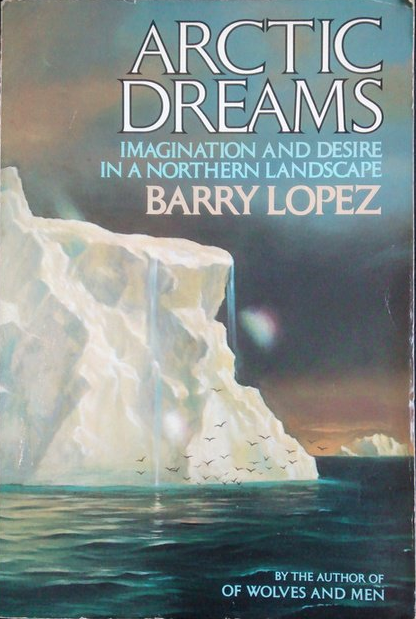 Returning to Arctic Dreams, Barry Lopez says scientists can speak with precision only about the physical creature, ‘not the ecology or behavior of this social and gregarious small whale’. The book was published in 1986, and we’ve learned more about narwhals since, but their forbidding habitat means their obscurity ‘is not easily breeched by science’. Their population trend, for one thing, is unknown. Yet Lopez rustles up two dozen pages of material about narwhals, all of it beautifully observed, alongside similar explorations of polar bears, musk oxen, northern landscapes and their ice and light and the creatures (including humans) that dwell in or explore them. If that appeals, I highly recommend his book. Given the current climate breakdown, Lopez’s ‘celebration of the polar landscape’, as Robert Macfarlane put it, ‘might well turn into its elegy’. This entry was posted on Friday, February 8th, 2019 at 2:31 pm and is filed under animals, books, etymology, language, nature, science, words. You can follow any responses to this entry through the RSS 2.0 feed. You can leave a response, or trackback from your own site. 9 Responses to Is ‘corpse whale’ the real etymology of ‘narwhal’? The suggested wording is now “earliest-known use” rather than ‘”first use,” first appearance,” and so on in order that the public not think that such dates are necessarily the dates of earliest use, which are in fact almost always impossible to ascertain. Gold, David L. 2005. “An Aspect of Lexicography Still Not Fully Professionalized: The Search for Antedatings and Postdatings (With Examples Mostly from English and Some from Other Languages). Revista Alicantina de Estudios Ingleses. No. 18. Pp. 25-69 [https://rua.ua.es/dspace/bitstream/10045/5210/1/RAEI_18_02.pdf]. Thanks for the link; I’ll read your paper later. My suggested wording, for what it’s worth, is that you call it a ‘suggestion’ rather than a ‘correction’, since what I wrote was not incorrect. 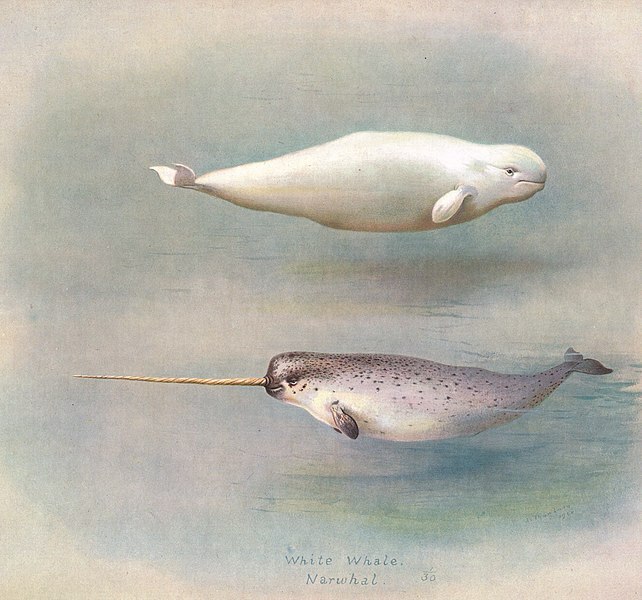 Inuit of Canada’s Eastern Arctic and Greenland knew of the narwhal. I just now asked a biologist who did field research in the Arctic what the Inuktituk word(s) for narwhal might be. He said (one) Inuktituk word for narwhal is QERNERTAQ, which he said means “black whale”. That would be in contrast with BELUGA, for beluga whale, in which the element is Russian for white or for a blankish colour. (As for the Inuktituk for beluga — sorry, I forgot to ask.) I think belugas were/are more common than the narwhal and have a wider range. I saw plenty of belugas dragged ashore one day, most of the people of a nearby village were down on the beach for the slaughter. Elsewhere, I only once saw a narwhal, a calf whose mother had been killed. The calf was shipped out to an aquarium in NYC. I was told just now that it survived the journey but died in New York. Canada Post long ago had two different five cent stamps that showed narwhals; if interested, one might check the web for the images. And (psst) I’ve a narwhal tusk on the wall behind me, a nice one (not to tell Animal Welfare). Thanks for sharing that. Most of the regional terms used in the book are from the Inuktitut dialects, but I don’t think qernertaq features. Lopez, I should add, addresses in an endnote the issue over using Eskimo as opposed to more specific, and less problematic, alternatives. In contrast to the apparently coastally-adapted belukha, biologists believe the narwhal is a pelagic or open-ocean species, that it is more ice-adapted, and that it winters farther to the north. Yes, among other things, probably. See the link in the post’s penultimate paragraph. David Attenborough’s online video “Natural Curiosities — A Curious Twist” refers to the twisty look of the narwhal’s tusk or tooth. DA calls it a /tooth/ because of its dentin (dentine) content. (Does that mean it is not ivory?) Its /twist/ reduces drag. DA points out that while the male has the tusky tooth, the female has none.. If the male narwhal uses its tusky tooth or toothy tusk to spear fish, he asks how does the fish get from the spear’s tip down to where the animal can ingest. And the female needs equally to eat, so how? He goes over these items, and others. If that’s what Attenborough said, he oversimplified: occasionally, female narwhals do have a tusk (or even two, in one reported case in Germany in the 17thC). In the Middle Ages, its association with unicorns meant the tusk, or bits thereof, sold for twenty times their weight in gold. i simplified. I’m not Attenborough.